Praised by the Philadelphia Inquirer as ‘a startling conducting talent’, Lio Kuokman was the laureate at the Svetlanov International Conducting Competition in Paris. Lio has served as assistant conductor to music director Yannick Nézet-Seguin at the Philadelphia Orchestra, the first Chinese conductor to be appointed in this position in the history of the orchestra and recently appointed as the Music Director of the Hong Kong New Music Ensemble. Lio has worked with many leading orchestras around the world including the Philadelphia Orchestra, Rotterdam Philharmonic, Radio France Philharmonic, Seoul Philharmonic and Danish National Symphony Orchestra. Recent highlights include debut with the NHK Symphony, Detroit Symphony, Tokyo Metropolitan Symphony, a new opera production of Puccini’s La bohème in Hong Kong, Vail festival with the Philadelphia Orchestra, Festival de la Roque d’Anthéron in France with Sinfonia Varsovia and return to Nantes and Japan La Folle Journées Festival, and a celebration concert conducting the Hong Kong Philharmonic with the presence of the President of China Xi Jinping. His coming season highlight include debut with the Moscow Philharmonic and subscription debut with the Kyoto Symphony. Equally sought after as an opera conductor, Lio has conducted in many opera productions including L’elisir d’amore, Pagliacci, Turandot, Il Trovatore, Rigoletto, Carmen and was invited by Maestro Valery Gergiev to be the guest conductor at the Mariinsky theatre conducting Rimsky-Kosarkov’s The Maid of Pskov. As a pianist, he has performed as soloist with many orchestras including the Salzburg Camerata and the Fort Worth Symphony. Lio received his degree from the Hong Kong Academy for the Performing Arts, the Juilliard School, the Curtis Institute of Music and the New England Conservatory. He has studied with Otto-Werner Mueller and Hugh Wolff and in master-classes coached by Sir Simon Rattle, Michael Tilson Thomas, James Levine, Christopher Eschenbach and Alan Gilbert. 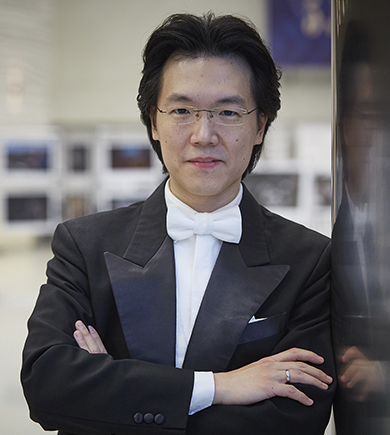 Lio is a founding member and President of the Macao Chamber Music Association. For his contributions to the development of arts and culture, Lio has received Certificate of Commendation and Medal of Cultural Merit from both governments of Hong Kong and Macao.